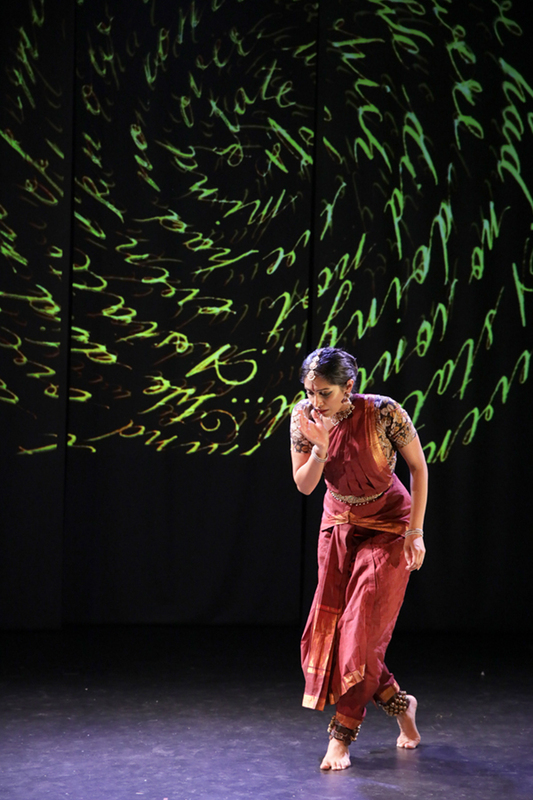 Nadhi Thekkek is the founder/artistic director of Nava Dance Theatre, and Rupy C. Tut is a painter and calligrapher. Together, they are working on a project, Broken Seeds Still Grow: Taking Root, that explores the Partition of India and how the 1947 event continues to affect the Indian diaspora in the Bay Area today. Here, they share why exploring Partition has important ramifications on understanding the current political climate in America. Broken Seeds Still Grow: Taking Root will be performed March 29-31 at CounterPulse in San Francisco. What kinds of performance or artistic practices have shaped who you are? Nadhi: I’m a Bharatanatyam dancer, a classical dance from South India. I’ve been training in this art form for almost three decades. Even though it’s from India, a lot of master practitioners are in the Bay Area, just by nature of the diaspora and immigration. I had the opportunity to study in San Jose for a long time, and now I go to India once or twice a year to train. My practice is based on a lifelong learning of Bharatanatyam, but also its application in my own life and how it reflects my experiences. Rupy: I grew up in India until I was about 11 before moving to the Bay Area. 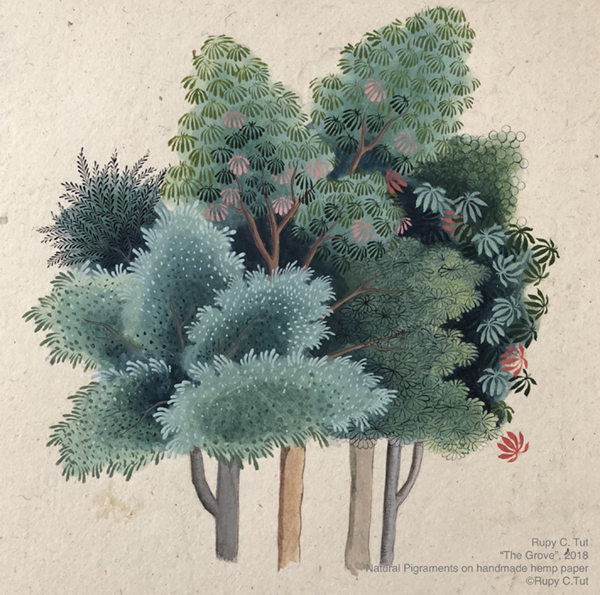 When I started my career as a visual artist, I landed on traditional Indian miniature paintings and calligraphy of mainly South Asian languages. The main reason I chose these forms is because both are rare or dying art forms. I became a revivalist; my goal is to preserve them through my practice. At the same time, because I have a strong American identity, I try to experiment with these forms as much as possible because I believe traditional forms need relevance and application in order to survive. Can you tell me about Broken Seeds Still Grow: Taking Root and how this collaboration came about? Rupy: For this collaboration, Nadhi and I were both independently interested in the 1947 Partition of India. The event impacted 15 million people. Four of the many million refugees created were my grandparents, so Partition was practically a bedtime story. The collaboration with Nadhi began when she asked me about my secondhand experience of Partition. 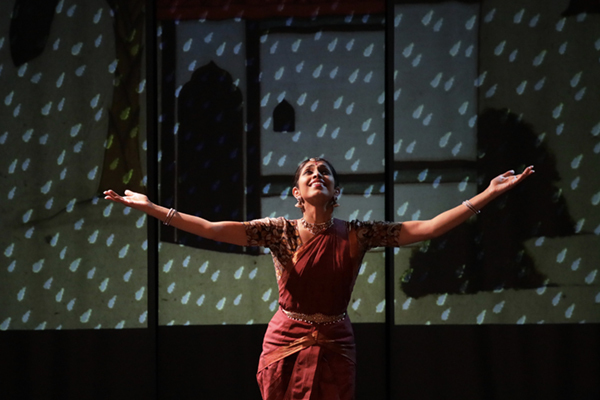 We realized that I could visually speak to the story, while Nadhi could choreograph the emotions we’ve felt as people who have experienced Partition from afar, both chronologically and outside of India. Nadhi: We were independently working on Partition for different reasons. For Rupy, part of her interest was her strong family history. For me, it was the opposite. The 1947 Partition divided what was then India into what is now India and Pakistan. More than one million people died and 15 million refugees were created, and yet it felt so far removed from myself. I asked: How is something that was so huge not something I had learned a lot about even though I identify as South Asian? I began a discovery process to learn more and realized there is an archive in Berkeley. Reading the witness statements, I was struck by the xenophobia, and it reminded me of what’s going on in our country now. History repeats itself. The project came from wanting to learn this history as well as wanting to share the fact that things like this still happen. Rupy: Even though Nadhi was removed from Partition, both of us have a strong sense of what it means for us to live in the Bay Area today where we’re always going to be looked at as “South Asian” creatives. No matter how American we think we are, we’ve always been othered on some level. It’s hard in that context to figure out how to raise kids and make them feel like they belong here. The production and collaboration came out of us telling each other how we feel, as well as strengthening each other’s conviction. For someone who is unfamiliar with your work, how would you describe it? 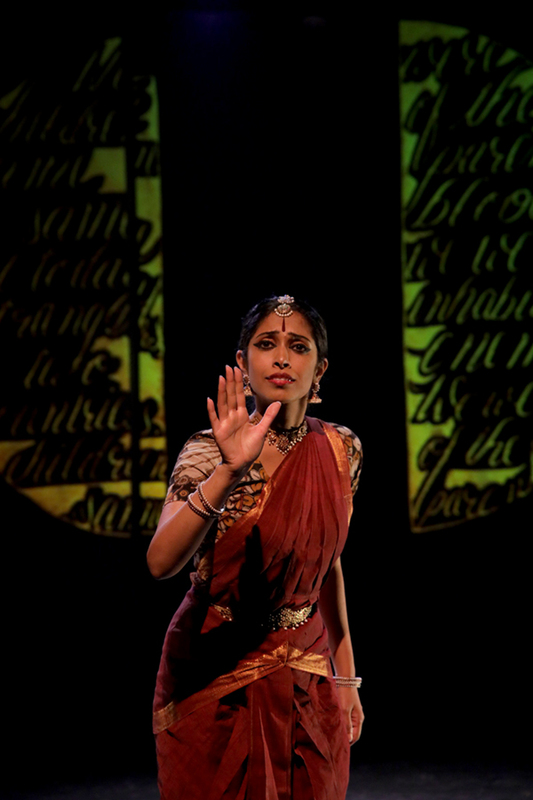 Nadhi: My particular interpretation of Bharatanatyam is through ensemble work. There are often many dancers onstage, though there are solos in my shows. Bharatanatyam itself is rhythmic and percussive, so the dancers act as an additional instrument through the footwork. The movements themselves are dynamic – we jump and stretch, and are grounded, earthy and percussive. The costumes traditionally tend to be bright, but my work tends to tone down the costumes and jewelry to highlight what the dance itself has to say. Another part of my work is storytelling and building narrative from what I see in real life versus what is traditionally taken from Hindu myths. In that sense, my work is experimental; it pushes what we dance about. Doing this work that is reflective of what’s going on in the world today is not typical. While the movements look traditional, the narrative and emotional score is contemporary and is meant to relate to people in the audience. Hand and facial gestures are key in the artform. While the movements can be restructured in a lot of ways, the storytelling aspect is unique to Indian classical forms. Rupy: My art practice is rooted in the traditional way of preparing all the materials before even starting with the painting. I prepare the paper myself. My pigments are ground from stone to powder and then mixed with a binder, which is a lengthy and tedious process. With the characters I end up painting, I’ve always been fascinated by what’s beautiful to look at. Beauty is done through detail; one brush I use is almost the size of the point of a hair. The significance of the work comes through the meditative and spiritual practice of pouring hours and hours into the preparation and application of the colors. Each painting goes through six to seven stages where color is layered on, burnished, and then more color is layered on, so there’s lots of rinse and repeat. The paintings are perceived to be small and are limited in size – that’s why they are called miniatures. People often use a magnifying glass to view them. Nadhi: Both of us read a lot and listened to podcasts about our history and the politics of South Asia. We both needed to have a good foundation of the actual content of what happened during Partition since our art seeks to reflect that. From there, we’ve been meeting weekly, building a narrative and story board of what we want to highlight and what relates to us now. That’s the starting place where we both developed the art and dance. Then we layered each other’s work to create a specific experience. Rupy: We also looked at the artistic response to Partition and South Asian immigration. The theme emerged of belonging and claiming homeland in a land that sometimes others you. Our research involved reading the poetry from Partition, as well as reading American poets like Langston Hughes. We’re sensitive about the fact that the story we tell is from our perspective. We’re not regurgitating or extrapolating. We’re not assuming we understand what early settlers went through. We’re saying: This is how we process today what they went through. This show is our response. That’s why this show applies to anyone who feels othered. The response to feeling othered is universal. Nadhi: The witness statements from the 1947 Partition Archive have always been our primary material. Now we’re using material from the South Asian American Digital Archive as well as information from local historians. That research is very different than what is usually done in our respective art forms. Rupy: As the miniature paintings are created, they are captured through video. They are then projected behind the dancers, but they are not a backdrop; they are another performer onstage. The projections are a mix of the paintings being created, manipulations to the paintings, and layering them with animation. The movement of the paintings is inspired by how the dancers move, but not necessarily of the same caliber or intensity. The original paintings will be exhibited in the space so the audience can experience the paintings in their actual dimensions, not just through the projection. Nadhi: What’s been awesome about this is, every step, Rupy is at our rehearsals, and I’ve gone to her art studio. If I’m choreographing a fighting scene, for example, Rupy might write calligraphy using the text we were inspired by or write it in a way that reflects the emotions of the scene. So the artwork comes out of the dance and, vice versa, the dance comes out of the artwork. Why does it feel relevant and important to explore the 1947 Partition of British India today and in the Bay Area? Rupy: There are two things that make this production very important. One is linking the history of our ancestors in India to those who moved to the US. So much of the diaspora life includes elements of our actual homeland and elements of our new homeland. Each of us have been brought up with dual identities. We’re very much American but also have South Asian customs and culture imbibed into our everyday life. The other thing that’s important is, in thinking about what is happening with the surge of anti-immigrant sentiment – why did my parents move here if we aren’t wanted? I’ve learned that in the 1900s, when South Asian workers moved here to the US as laborers, they faced discrimination. That history gives me strength to digest this xenophobia and feeling of being othered, and still put down roots, raise my children, and consider America my identity and homeland. There’s such a rich history of South Asians in the Bay Area, I can lean on that history to guide me through this world. Nadhi: Through our research, we’ve learned that hate crimes specifically against South Asians and Muslims have been happening for over 100 years, just as long as we have been in this country. It’s crazy how things don’t really change, but we are accountable for how we share what happens, and we don’t take that lightly. Rupy: That’s why the show is called “Taking Root.” We’re taking root in the creative environment of the Bay Area. We have to know how to speak against institutional bias against artists like us who come from a traditional medium. Although we’re working within an American context, we’re seen as traditional artists, and thus not as relevant. However, there’s beauty in a multi-ethnic identity. 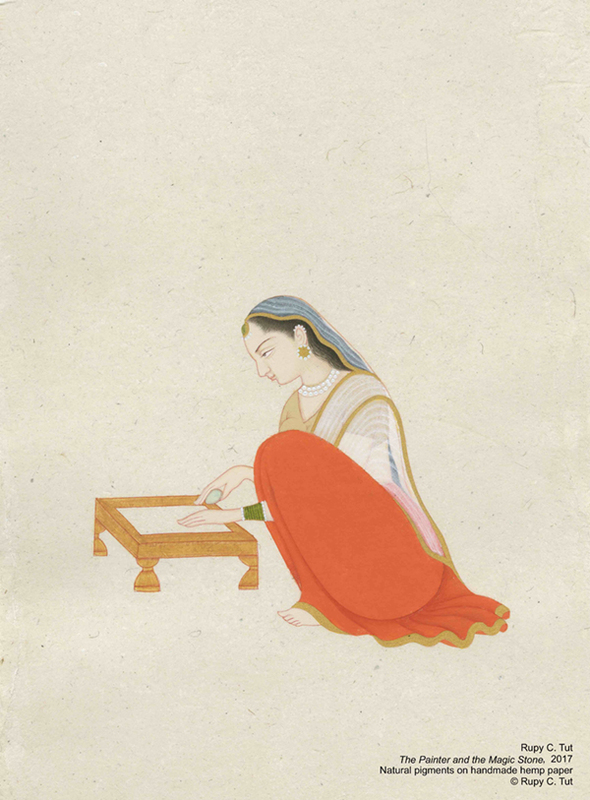 My American identity includes my identity as an Indian miniature painter, and I’m proud of it. If the audience can experience a little of that hyphenated identity, that’s worth it. There’s a way to claim my history and culture and still be American. Nadhi: The beauty is important, but we also want to show people that we’re relevant. We can’t hide our history and culture away, and we shouldn’t. It’s more important than ever to show people who we are. Nadhi: We want the audience to walk away with empathy for others who struggle, as well as a sense of hope. We get a sense of hope from making this work and processing the world around us. Rupy: Something I’ve been thinking about is that whenever hate crimes and negative events happen, I feel some sort of sadness or powerlessness. Working on this production has made me feel more powerful by bridging connections and gaps, not only within my community but within other communities as well. We have not always been this divided; there are huge overlaps between the struggles within different immigrant communities. I hope audiences can feel more activated against prejudice. With this work, we’re really taking it home.